In a Nutshell: With the summer travel season in full swing, travelers all around the country are experiencing longer waits at security checkpoints, and passengers who don’t properly plan and pack can see these delays cut into their vacation time. 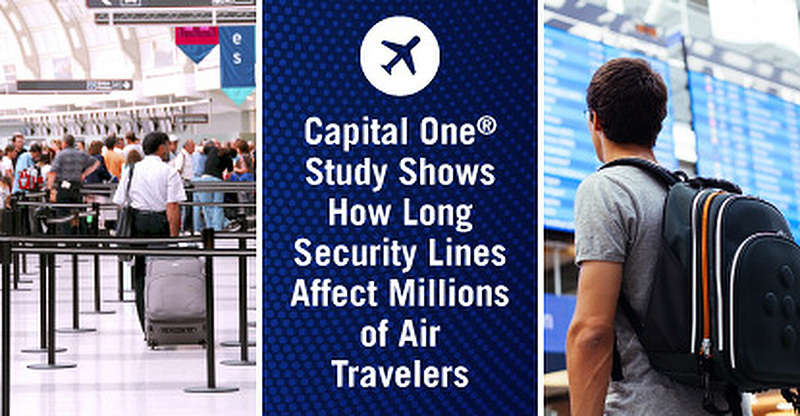 Capital One® and ORC International recently surveyed more than 1,000 Americans on how airport security lines impact the way they travel. The survey found that many travelers are altering the way they prepare for and approach their trips, from how early they arrive at the airport before a flight to how they pack their bags for smoother screening. Other travelers take advantage of quick-screen programs, like TSA Pre✔® or Global Entry, to speed the process, a cost reimbursed by a range of popular travel cards, including the Capital One® Venture® Rewards Credit Card. I’m a regular traveler for both business and pleasure. I’ve seen enough US airports to know which ones to avoid for layovers, and when to schedule flights to shorten the time it takes to get from the security checkpoint to my gate. But that experience doesn’t make me immune to delays. I’ve spent my fair share of hours in security lines watching my cellphone battery drain while reading the latest news stories and wondering if I’ll miss my flight. Many people see that blood-pressure raising frustration as a part of the air travel experience. Delays happen, as do missed flights — and ruined vacations. Air travel seems to set a new record every summer, and this year will be no different. But as the popularity of air travel continues to increase, many airports are neglecting to add extra security lines to accommodate the growing crowds. To better understand the consumer experiences, Capital One® and ORC International recently surveyed more than 1,000 Americans on how airport security lines impact the way they travel. “With summer air travel projected to reach an all-time high, and the TSA expecting a record-breaking 243 million people to pass through security checkpoints across the US, we wanted to better understand consumers’ experiences at the airport,” said a Capital One Financial representative. 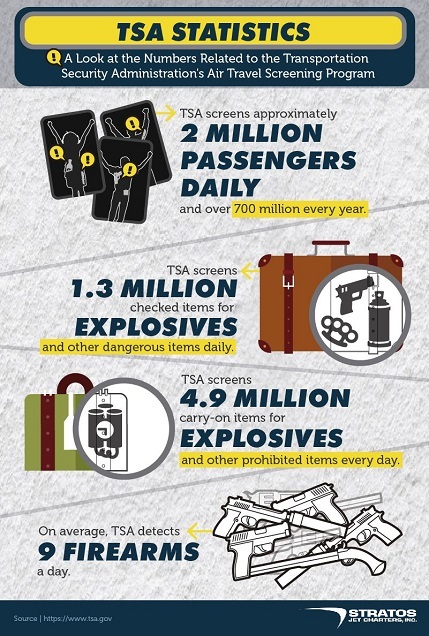 Approximately 65% of the travelers surveyed said that airport security lines impact the way they pack. Furthermore, more than 1 in 4 consumers say the long lines significantly influence their decisions, while having at least some impact on the way the majority of travelers’ dress (62%) and when they arrive (63%) for travel. Survey responses showed that millennials feel the impact more than any other generation, with 78% indicating that long wait lines influence their travel packing, dressing, and airport arrival time. And with good reason. It turns out that 14% of consumers reported long waits at security caused them to miss flights in the past 12 months. This figure doubles — to 28% — for millennial flyers. Among those who use estimated security wait times to decide when to arrive at the airport, 48% said they arrive between 1.5 hours to two hours ahead of their flight time. This figure is even higher for baby boomers (53%) who tend to show up more than two hours before their scheduled flights. I’ve learned over the years that packing light makes the airport experience easier and much faster. Over the last decade, I’ve ditched the traditional suitcase and honed my ability to pack a week’s worth of necessities into one backpack. As a result, I have very little to place on the rollers or take through the X-Ray machines. I also don’t have to struggle with overhead bins and I never exceed my carry-on allowance. Of course, the minimalist travel style isn’t feasible for every flyer — or even most of them. But that doesn’t mean there aren’t things you can do to pack (and dress) smarter to make the screening process as quick — and painless — as possible. For example, while I still go for sneakers and socks myself — being barefoot on airport floors is a risk I’d rather not take — more and more travelers are opting for sandals or other easy-off shoes to avoid having to fiddle with shoelaces at the checkpoint. And they’re not alone. For survey respondents who say long lines significantly or somewhat influence the way they dress, 65% opt for slip-on shoes so they can easily remove them and move through the security line. And 56% do not wear a belt or jewelry that require removal. 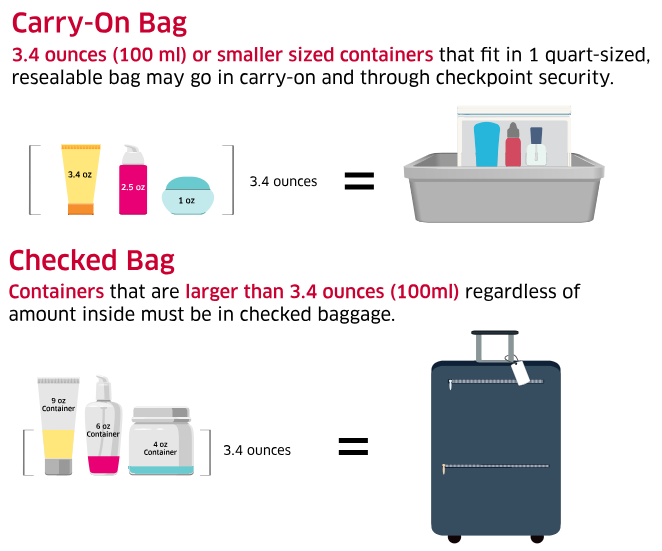 The TSA has strict guidelines on what you can transport in your carry-on bag, like restrictions on the amount of liquid you can pack. There are strict guidelines on the items that can be packed in a carry-on bag and which must be transported in checked bags — or not at all. The stats show that more Americans are adapting to the new normal by altering the way they pack. Just because long security lines are the norm at most US airports doesn’t mean your travel plans have to include extended waiting periods. Programs like TSA Pre✔® and Global Entry allow travelers to bypass the traditional lines and take part in an expedited security checkpoint service that can drastically cut down how long it takes you to get to your gate. According to TSA, 93% of TSA Pre✔® passengers waited in airport security lines for less than five minutes. TSA reports that the majority of passengers in standard security lines can wait up to 20 minutes. While joining programs like TSA Pre✔® requires paying a membership fee, a number of top travel credit cards now provide a statement credit to offset membership costs. The popular Capital One® Venture® Rewards Credit Card, for instance, offers cardholders a statement credit of up to $100 every four years to cover membership in either TSA Pre✔® or the Global Entry program. 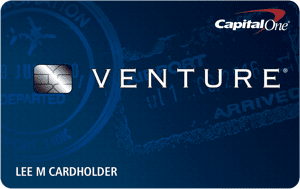 Capital One® Venture® Rewards Credit Card customers can apply online for either TSA Pre✔® or Global Entry, and when they pay with their Capital One® Venture® Rewards Credit Card, they receive up to $100 back as a statement credit on their account. “Customers are re-eligible for the benefit every four years, which allows them plenty of time to renew their TSA Pre✔® or Global Entry membership, which expires every five years,” said the Capital One Financial representative. When you combine that statement credit with the Capital One® Venture® Rewards Credit Card’s flexible, blackout-free travel rewards, you can see why the Capital One® Venture® Rewards Credit Card is one of Capital One’s most popular offerings. “Based on the survey we conducted, we know that 55% of people have spent up to $2,500 over the past year visiting friends and family or for a life event,” the Capital One Financial representative said. Capital One® Venture® Rewards Credit Card customers earn an unlimited two miles per dollar on all purchases, and 10 miles for every dollar spent on hotels at Hotels.com/Venture. Miles are redeemable as a statement credit that reimburses cardholders for eligible travel expenses. Cardholders can redeem the miles they earn however they want, no matter what kind of trip they take. Plus, every 10 nights booked through Hotels.com earns customers one free night, which is an extra savings in itself. Depending on where you’re going and how long you’ll be there, the time you spend in a security line or in the air is but a small portion of your overall vacation. While an unexpected delay can dampen or possibly even ruin your travel experience, there’s no reason to cancel or delay your plans because of what could happen. Just ask the 62% of survey respondents who agree, or strongly agree, that they are happier and more personally fulfilled because they’ve traveled in the past 12 months. This is even higher for consumers with children at home (74%), and half of the consumers surveyed said they would consider taking a life-defining trip, such as a yoga retreat or spiritual journey. This viewpoint is even more prevalent among millennials who tend to value experiences over possessions.